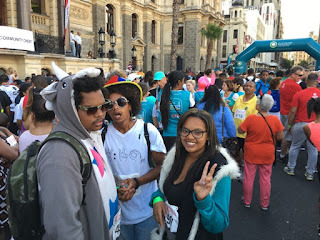 Please vote for my blogs in the SA Blog Awards 2015 competition. Both my blogs have been entered into the SA Blog Awards 2015. If you like the content of the blogs, then please vote for my blogs. Perhaps a brief profile of each blog will help refresh your memory of the focus of my blogs. In my lifestyle blog, www.3dreflectionsoflife.com, I generally write about all my experiences and encounters from breakaways, friendships, family life, to personal nuggets of my own life. Sometimes I ramble on about little things and at other times I am just giving you peek into the real me. In my educational blog, www.schoolcorridor.com, I focus on school matters. I try to share stories of schools, give advice on management and leadership, human resource management and other school matters. I hope that The School Corridor Tatler will become a useful resource for school managers and their SMT teams. I wish I had more time to write posts but perhaps in the future, I will be able to generate far more posts than I do now. 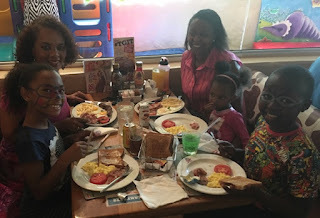 Having Breakfast with my granddaughter and my Rwandan family. Saturday was breakfast time with my granddaughter, Tanika, Alice and her adorable children . In fact, I have three grandchildren because I have adopted Alice and Albert's children - Joshua and Hannah - as my grandchildren. I have known Alice and Albert for a while now because we belong to the same church, St. Marks. Whenever we see each other at the church service, Joshua and Hannah come and greet their 'Grandmamma' ever so excitedly. Today was our breakfast date, a treat to celebrate the beginning of the school holidays for Joshua and Tanika. Tanika chose the Spur in Tokai because of the generous indoor and outdoor play areas. While the children were having their faces painted and exploring all the games, Alice and I had a wonderful conversation. Alice and Albert are Rwandan refugees. Albert has recently qualified as a male nurse while Alice is studying occupational therapy. And they have two beautiful kids to raise. Community Chest Twilight Team run 2015 was a fun-filled community and family event. We were there to participate in the Community Chest Twilight Team run this year. We wanted to be part of the fun. I should have planned my outfit better, but like many, I am always caught napping. However, I made sure that my outfit was symbolic. I wore a red sweater to symbolize World Aids Day Awareness, a handwritten poster which read " Leave our women and children alone", as part of the 16 Days of Activism against Gender Violence and a spiky, blue wig and red cheeks as part of the fun element. At the start, we counted down from 33 because the Community Chest Twilight Run celebrated its 33rd anniversary this year. Then off we went, literally strolling for the entire five kilometers. 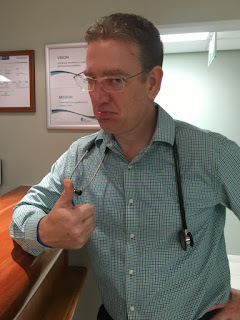 My routine check at the oncology unit is upstaged by my doctor's thumb. This morning I went to Rondebosch Medical hospital for my first routine check after the radiotherapy treatment I had. In my head, I would just breeze into the oncology unit, chat to my doctor, Doctor Hart and then fly out there again. Well, that was the theory. The reality is that somehow, life likes to take its own turns. When I arrived at the hospital, Bilqis, Dr Hart's secretary, gave me a warm welcome. We were happy to see each other after all these months and the two of us competed to share as much as we could before my consultation with Doctor Hart. Bilqis complimented me on my new hairstyle - a tightly curled arrangement that ended just past my neckline. At this point, all the other ladies joined in on the conversation. Yes, they too, liked the new hairstyle. Did I cut my hair since they last saw me, they asked.